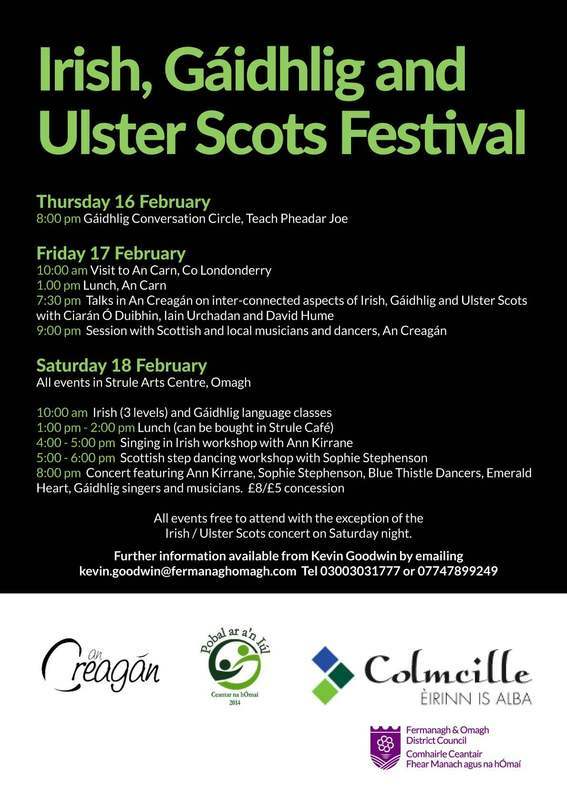 ​A three day festival of Irish, Gàidhlig and Ulster Scots culture is set to take place in the Fermanagh Omagh district from Thursday 16 to Saturday 19 February 2017. This event will coincide with the visit of a group of Gaidhlig speakers and learners from Inverness in Scotland to the Omagh area for the duration of the festival. Organised by Fermanagh and Omagh District Council, the festival programme includes language classes, music, song and dance, study visits and talks. The festival weekend will be will brought to a resounding close with an Irish and Ulster Scots Concert in the Strule Arts Centre, Omagh. The festival of language and culture will start at 8 pm on Thursday 16 February with a social night in Teach Pheadair Joe Haughey, An Creagán. The evening will begin with a Gaidhlig conversation class where a group of Gaidhlig speakers from Inverness in Scotland will also be in attendance. Gaidhlig is a minority language still spoken on Scotland’s Western Isles. There will also be music and song from local musicians as well as the Scottish visitors. On Friday 17 February there will be a study visit to An Carn in County Londonderry to learn how the Irish language has been developed as a community development tool in that area. Then at 7.30 pm on Friday 17 February in An Creagán Visitor Centre, three guest speakers will talk about aspects of the Irish, Scots Gaidhlig and Ulster Scots languages, emphasising the links between the languages and how they can be used as a source of inspiration. This will be followed by a social night where music and singing will be informally performed by both locals and members of the visiting Scottish group. On Saturday 18 February the events of the weekend festival will take place in Strule Arts Centre, Omagh. They will begin at 10 am with a one day Irish language course for beginners, improvers and advanced level and a Gaidhlig language class. These classes will run to 4 pm, with an hour’s break for lunch. Immediately after the language classes Ann Kirrane will give an hour long workshop in singing in Irish. Ann grew up on the shores of Galway Bay where her childhood revolved around the traditional music of the old Gaelic way of life. After the singing workshop Sophie Stephenson will tutor an hour long workshop in Scottish step dancing. Scottish step dancing is similar to Irish percussion sean-nós dancing. Sophie is particularly interested in the rhythmical relationships between language, music, song and dance, something she brings across in her workshops. 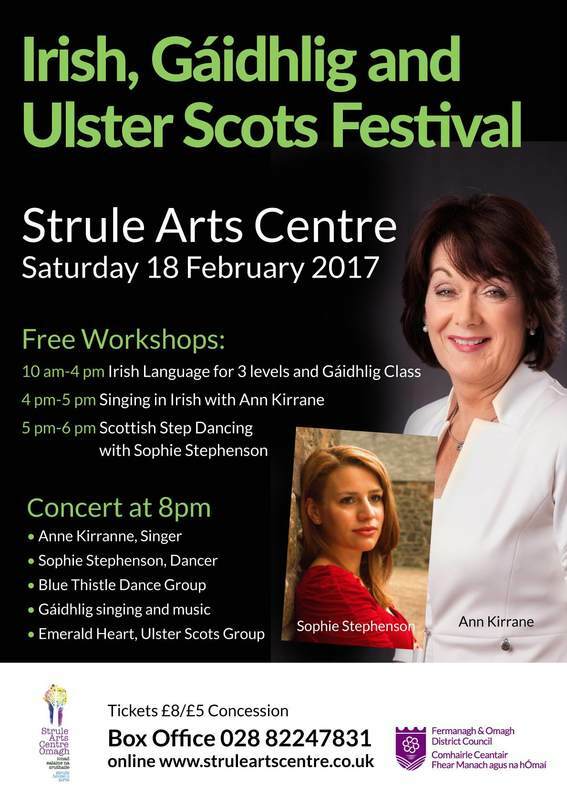 Ann and Sophie will both perform at the Ulster Scots and Irish concert in the Strule Arts Centre on Saturday 18 February at 8 pm. Also performing at the concert will be the local Blue Thistle Highland Dance troupe, Castlederg based Ulster Scots group, Emerald Heart and performers from the visiting Scottish group that will include singing in Gaidhlig. Concert tickets costing £8 or £5 concessionary can be purchased online at www.struleartscentre.co.uk or by phoning the Box Office at 028 8224 7831. Attendance at all other festival events is free. For further information on the festival please contact Kevin Goodwin, Fermanagh and Omagh District Council, by telephoning 0300 303 1777 (calls charged at local rate) or email kevin.goodwin@fermanaghomagh.com.